Last year saw the launch of no less than two books from LSI authors. 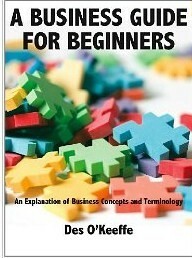 The first was ‘A Business Guide for Beginners’ by our very own Executive teacher Des O’Keeffe. Des got the idea of writing this book after several years of explaining business concepts and vocabulary to students (and it has to be said to some of the teachers as well). He certainly has the background and experience to be able to write about such a subject having had a 30 year business career and an MBA from The University of Bradford. He worked in the financial area, helping to set up Tesco’s Hungarian operation, and held a financial directorship in Poland. Des has been teaching English since 2003, has also taught on an MBA course in Latvia, and has provided financial training in Malawi. “Many, whether completing their education or looking for a change of career, will have started to consider entering the business world, whether taking up a career in industry, starting up their own business or studying business. In any case, the first barrier to overcome may be complete or partial lack of knowledge of what business is actually all about; its basic concepts and terminology. … (It) provides … a solid basis for any future business student, business English teacher, enthusiast – or someone who simply wants a business ‘quick fix’. … It is ideal as an addition to a business English teacher’s resource shelf or for use as a reference book for business students.